This year, rather than using R to pull the AERA tweets I used Martin Hawksey’s Twitter Archiving Google Spreadsheet TAGS v3. It was a straight forward set up that produced some nice summaries and rolling updates. While I think the TAGS v3 utility is excellent for planned events, such as conferences, where hashtags are agreed upon in advance and used with a high frequency (1000’s of tweets rather than a couple hundred), I still like using R for hashtags that are used more informally or periodically. 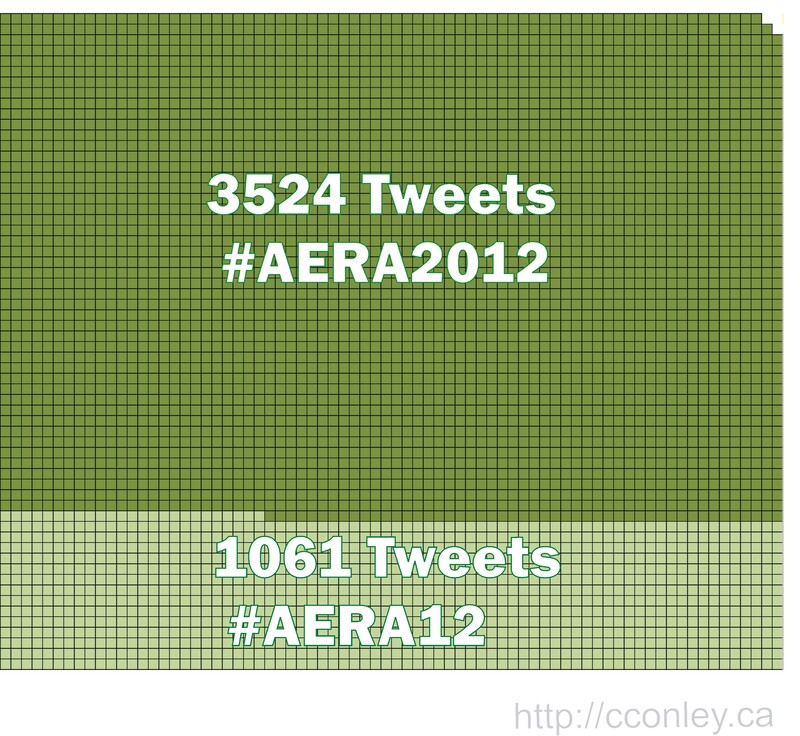 4585 tweets were shared with the #AERA2012 or #AERA12 hashtags. If you are interested in exploring the AERA tweets in more depth, feel free to use this cleaned spreadsheet and let me know how you are using the data and what you find. For a qualitative look at the AERA tweets, Bodong Chen shared this post using “Overview”, a prototype designed for the exploration of trends and patterns within large document archives (think wikileaks). 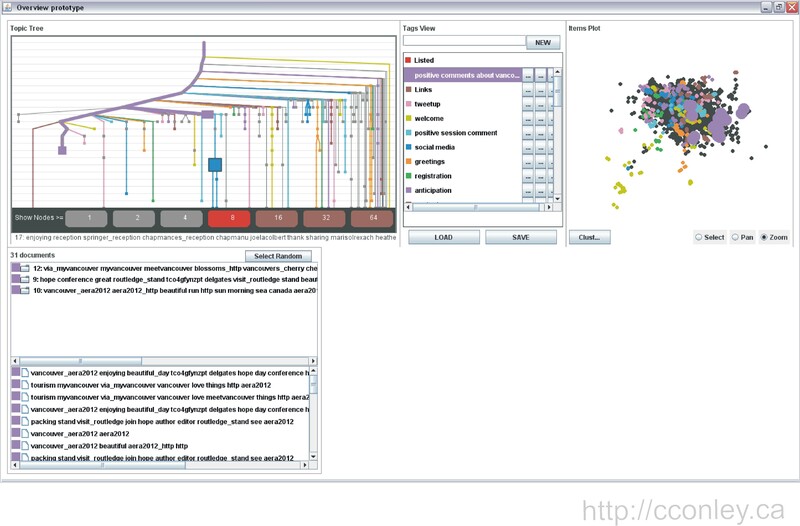 One of the nice aspects of this utility (and wonderfully reviewed by Bodong) is Overview’s visual approach for clustering . I find the visual presentation of clusters in relation to frequencies a much more enjoyable approach than the typical qualitative processes. As Bodong observes, Overview is a great way to explore a large set of tweets. One of the challenges of using this with twitter archives is that spelling variations (abbreviations and creative spellings commonly found in tweets to maximize content) is likely to confound the stemming process. However, for open-ended survey responses I have found the clustering to be more straight forward and useful. While I tend to use R for these tasks, Overview is a great utility to include in your toolkit. For those interested, Overview is available on Git and requires both Ruby and Java. *Note: the structure of the tweets in the Overview screen shot (above varies from Bodong’s because my archive included both the #AERA2012 and #AERA12 hashtags. This entry was posted in Top-TIER. Bookmark the permalink. Great post Chris. ‘Overview’ is a new one for me so I’ll have to go and play. It’s interesting that you mention R. I was finding I could only do some much processing in the TAGS so started using the spreadsheet as a data source, pulling into R, doing some analysis then pushing selected results back to the spreadsheet (here’s an early example http://mashe.hawksey.info/2012/01/tags-r/). 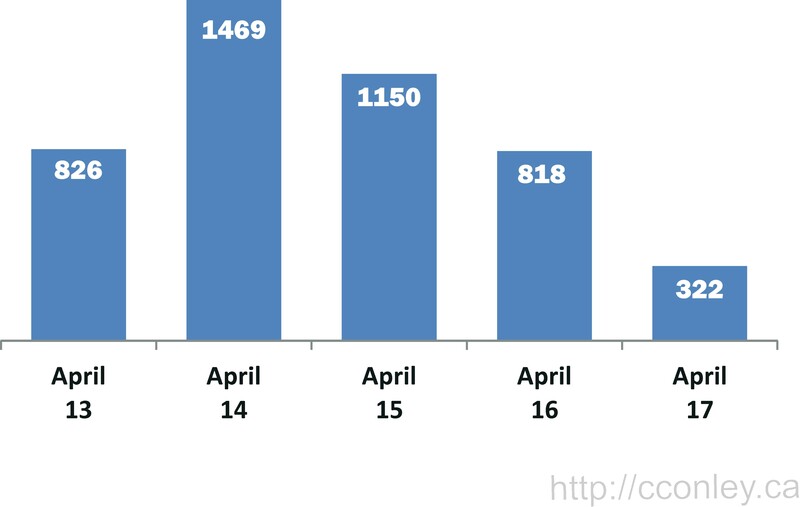 Thanks for “pinging back” to my blog post and your further analysis from a more statistical angle. I’m also very interested in information visualization and its application in education. R is on my “to-learn-list” and I had a great time playing with Processing. I look forward to meeting with you soon.